About Russia ??????? ????????? Per Rusine ??? ????? Birth and death rate in Russia since 1950 till 2010. Does Russia need Golden Rouble? Russia is the largest country in the World, covering 17,075,400 square kilometers (6,592,800 square miles). Its population, being the ninth-largest in the world, is 141,927,297 people. However, permafrost occupies 60% of its territory, while 25% of the land swampy, engaged or in inland water bodies. Therefore just 15% (2,561,289 sq. km) of Russian territory are suitable for habitation and economic activities. This is slightly less than the territory of Kazakhstan (2.77 million sq. km.) and 3.8 times smaller than the U.S. territory. Nevertheless, Russia possesses the world's largest reserves of mineral and energy resources. Russia established worldwide power and influence from the times of the Russian Empire to being the largest and leading constituent of the Soviet Union, the world's first constitutionally socialist state and a recognized superpower, that played a decisive role in the Allied victory in World War II. The Soviet era saw some of the greatest technology achievements of the 20th century, such as the world's first human spaceflight. The Russian Federation was founded following the dissolution of the Soviet Union in 1991. The total length of roads in Russia is 624,000 sq. kilometers. There are 157,895 localities in Russia, 39,278 (25%) of those are uninhabited. 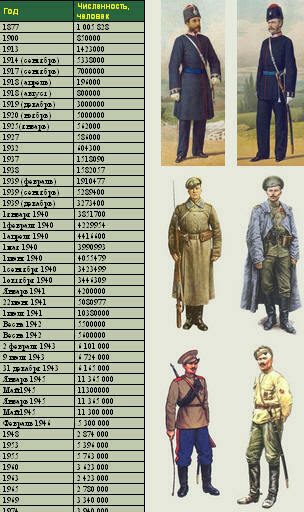 On the ethnic composition of Russia's population consists almost entirely of the Russians (79.83%). 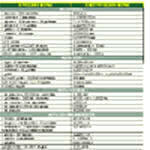 Minorities include 194 ethnic groups, the most significant of which are Tatars ? 3.8%, Ukrainians ? 2%, Bashkir ? 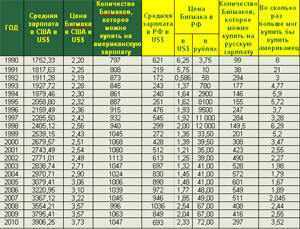 1.29%, Chuvash ? 1.12%, the Chechens ? 0.93%, Armenians ? 0.78%, Mordovians ? 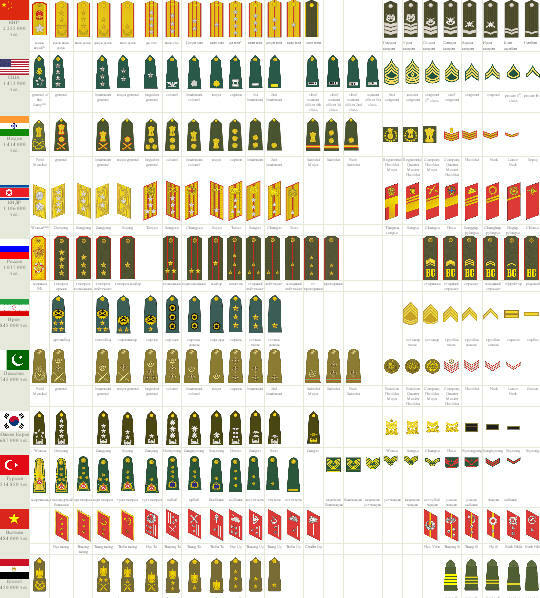 0.58%, Avars ? 0.56, Belarusians ? 0.55%, Kazakhs ? 0.45%. However, in the Russian capital Moscow ethnic Great Russians make up only 31% of the population. Russia ? a federal republic with a bicameral legislature, called the Federal Assembly. It includes the Federation Council and State Duma. Head of State ? President. Since 2008 ? 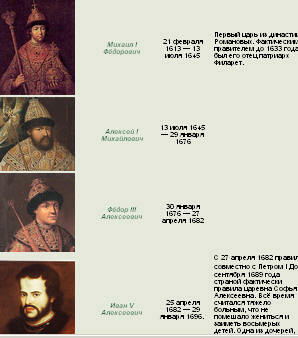 Dmitry Medvedev (See: Full list of chapters Russian State from the VIII century to the present day.) Head of Government ? Prime Minister. Since 2008 ? Vladimir Putin (See: Full list of chapters of my Government in 1802 to the present day.) Largest Gross Domestic Product (GDP), equal to 2.288446 trillion, Russia has the world's sixth place (between Germany and the UK). However, the distribution of GDP per capita (8874 dollars), it is located at 54 th place (between Uruguay and Chile). 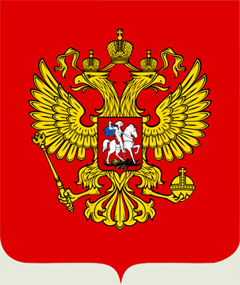 The State Emblem of the Russian Federation is a picture of a golden double-headed eagle has been placed on a red heraldic shield and over the eagle ? the three historical crowns of Peter the Great (above the heads ? two small, and above them ? a larger size) in the clutches of the eagle ? the scepter and orb, on the chest eagle on a red shield is a horseman spearing a dragon. The national flag of the Russian Federation is a rectangular cloth of three equal horizontal bands: upper ? white, middle ? blue and lower ? red. Initially, during the time Alexis is trehtsvetie signified the unity of the Great, Small and White Russia in the Russian kingdom. Capital ? Moscow. Currency ? the Russian ruble. 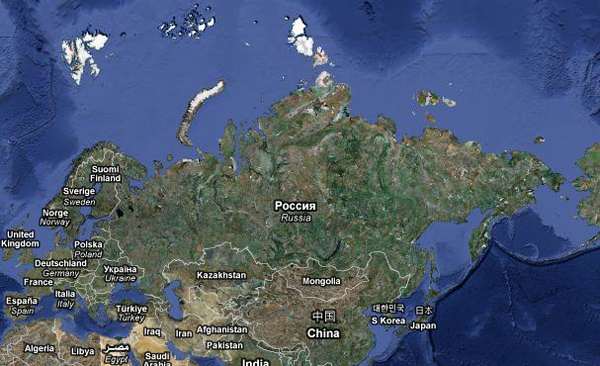 The two widest separated points in Russia are about 8,000 km (4,971 mi) apart along a geodesic line. These points are: the boundary with Poland on a 60 km (37 mi) long Vistula Spit separating the Gdansk Bay from the Vistula Lagoon; and the farthest southeast of the Kuril Islands. The points which are furthest separated in longitude are 6,600 km (4,101 mi) apart along a geodesic line. These points are: in the west, the same spit; in the east, the Big Diomede Island. The Russian Federation spans 9 time zones. 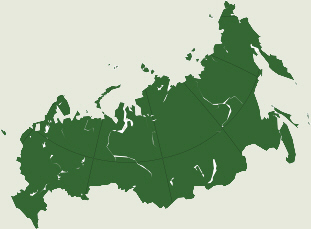 Most of Russia consists of vast stretches of plains that are predominantly steppe to the south and heavily forested to the north, with tundra along the northern coast. Russia possesses 10% of the world's arable land. Mountain ranges are found along the southern borders, such as the Caucasus (containing Mount Elbrus, which at 5,642 m (18,510 ft) is the highest point in both Russia and Europe) and the Altai (containing Mount Belukha, which at the 4,506 m (14,783 ft) is the highest point of Siberia outside of the Russian Far East); and in the eastern parts, such as the Verkhoyansk Range or the volcanoes of Kamchatka Peninsula (containing Klyuchevskaya Sopka, which at the 4,750 m (15,584 ft) is the highest active volcano in Eurasia as well as the highest point of Asian Russia). The Ural Mountains, rich in mineral resources, form a north-south range that divides Europe and Asia. Russia has an extensive coastline of over 37,000 km (22,991 mi) along the Arctic and Pacific Oceans, as well as along the Baltic Sea, Sea of Azov, Black Sea and Caspian Sea. The Barents Sea, White Sea, Kara Sea, Laptev Sea, East Siberian Sea, Chukchi Sea, Bering Sea, Sea of Okhotsk, and the Sea of Japan are linked to Russia via the Arctic and Pacific. Russia's major islands and archipelagos include Novaya Zemlya, the Franz Josef Land, the Severnaya Zemlya, the New Siberian Islands, Wrangel Island, the Kuril Islands, and Sakhalin. The Diomede Islands (one controlled by Russia, the other by the U.S.) are just 3 km (1.9 mi) apart, and Kunashir Island is about 20 km (12.4 mi) from Hokkaido, Japan. Russia has thousands of rivers and inland bodies of water providing it with one of the world's largest surface water resources. The largest and most prominent of Russia's bodies of fresh water is Lake Baikal, the world's deepest, purest, oldest and most capacious freshwater lake.Baikal alone contains over one fifth of the world's fresh surface water. Other major lakes include Ladoga and Onega, two of the largest lakes in Europe. Russia is second only to Brazil in volume of the total renewable water resources. Of the country's 100,000 rivers, the Volga is the most famous, not only because it is the longest river in Europe, but also because of its major role in Russian history. The Siberian rivers Ob, Yenisey, Lena and Amur are among the very longest rivers in the world. The country's original name was Русь (Rus'). This name is originated from the ancient Slavonictribesname of the Rugians, those originally inhabited the island of Rugen (current German name of the island also comes from the name of this tribe), and subsequently settled between the rivers Labe (Elbe) and the Odra (Oder). The tribe is first mentioned by the Roman author of the I century Publius Cornelius Tacitus in his book "De origine et situ Germanorum", written in 1998 AD. In ancient times, the sounds [g] and [z] were alternants in the Slavic languages. Thus, the plural of the word "RUG" sounded like "Ruzi. In the Novgorod dialect occurred reduction of sound [z] to [s]. Thus the word Rugs came to the word "Rus'". The word "Russia" comes from the word "?????" ? the Greek name of Russia in the Byzantine sources. Due to the moderating influence of the Atlantic or Pacific, the most populous areas of the country in European Russia, in the south of West Siberia and in the south of the Russian Far East, including the cities of Moscow and Saint Petersburg, experience a humid continental climate. (Koppen's Dfb, Dfa, Dwb, Dwa types). Most of Northern European Russia and Siberia between the Scandinavian Peninsula and the Pacific Ocean has a subarctic climate, with extremely severe winters (Dfd, Dwd) in the inner regions of Northeast Siberia (mostly the Sakha Republic, where the Northern Pole of Cold is located with the record low temperature of ?68 °C/?90.4 °F), and more moderate (Dwc, Dfc) elsewhere. The strip of land along the shore of the Arctic Ocean, as well as the Arctic islands, have a polar climate (extreme polar climate (EF) on some of the islands and tundra climate (ET) elsewhere). A small portion of the Black Sea coast, most notably in Sochi, possesses a humid subtropical climate (Koppen's Cfa) with unusually wet winters. Winter is dry compared to summer in many regions of East Siberia and the Far East (Dwa, Dwb, Dwc, Dwd types), while other parts of the country experience more even precipitation across seasons. Winter precipitation in most parts of the country usually falls as snow. The region along the Lower Volga and Caspian Sea coast, as well as some areas of southernmost Siberia, possess a semi-arid climate (BSk). 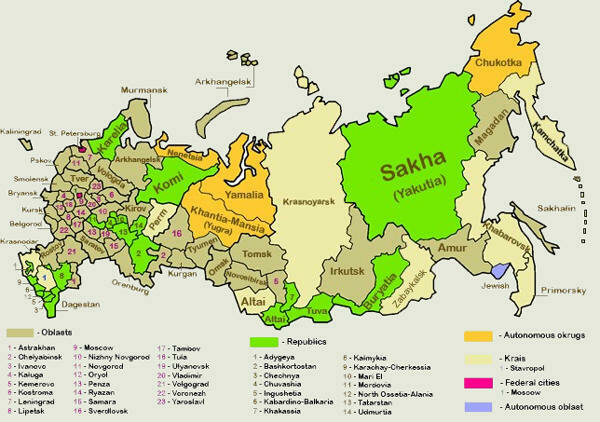 About 65% of the Russian territory is underlined by permafrost.°C. The Russian Federation comprises 83 federal subjectsThese subjects have equal representation—two delegates each—in the Federation Council. However, they differ in the degree of autonomy they enjoy. 46 oblasts (provinces): most common type of federal subjects, with federally appointed governor and locally elected legislature. 21 republics: nominally autonomous; each has its own constitution, president, and parliament. Republics are allowed to establish their own official language alongside Russian but are represented by the federal government in international affairs. Republics are meant to be home to specific ethnic minorities. 9 krais (territories): essentially the same as oblasts. The "territory" designation is historic, originally given to frontier regions and later also to administrative divisions that comprised autonomous okrugs or autonomous oblasts. 4 autonomous okrugs (autonomous districts): originally autonomous entities within oblasts and krais created for ethnic minorities, their status was elevated to that of federal subjects in the 1990s. With the exception of Chukotka Autonomous Okrug, all autonomous okrugs are still administratively subordinated to a krai or an oblast of which they are a part. 1 autonomous oblast (the Jewish Autonomous Oblast): originally autonomous oblasts were administrative units subordinated to krais. In 1990, all of them except the Jewish AO were elevated in status to that of a republic. 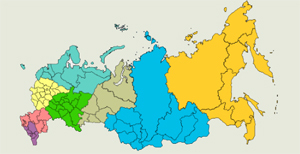 2 federal cities (Moscow and St. Petersburg): major cities that function as separate regions. Federal subjects are grouped into 8 federal districts, each administered by an envoy appointed by the President of Russia. Unlike the federal subjects, the federal districts are not a subnational level of government, but are a level of administration of the federal government. Federal districts' envoys serve as liaisons between the federal subjects and the federal government and are primarily responsible for overseeing the compliance of the federal subjects with the federal laws.